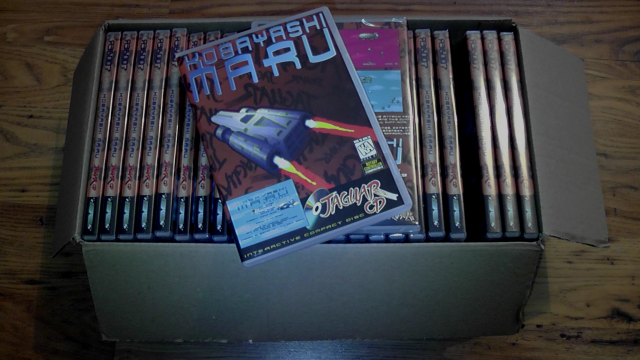 Reboot of Jagware and RGCD are pleased to announce the imminent release of Kobayashi Maru:Final. KM:F is an updated and fine-tuned version of Reboot's freely-released game of a year ago. The game is our version of an arcade favourite from the early 80s. Use your rotary controller (adjustable to allow for sensitivity of your particular spinner) or regular Jaguar pad to steer your warpship in this arcade space shooter, battling countless drones and huge boss craft in ever-tougher waves of attack. Featuring subtle use of the Jaguar's RMW graphics capabilities, background graphics blend together as you tear around in the upper atmosphere over 4 worlds. This version of the game has updated graphics, new sound effects, webscores and of course supports Memory Track game saves. The physical copy comes cellophane wrapped in a standard DVD box with full colour printed inlay and full face printed, glass-mastered CD, direct from the factory (100% professionally produced in the UK). Cost and shipping charges will be available on the RGCD site once the game becomes available (should be by the end of the weekend (Sun 2nd Dec) if everything goes to plan). Attendees at the recent eJagfest 2012 event were offered the game early at a discount as they supported the super-limited mini format release of the original version last year - thanks to all who picked it up at the weekend. Why are we now using a publisher and not making/selling games ourselves? We have limited time to work on our games for various reasons - we'd rather use that time making the games instead of assembling boxes and burning discs etc. Reboot's future releases on CD will be sold to generate a profit to be used towards the huge costs involved in manufacturing our (Jagware) flashcarts and allowing us to create bigger, better games in future (for example Rebooteroids) and offer them at a really good price without the need for pre-orders etc. Supporting our releases via our new publisher will hopefully help us reach our target of producing our first jagtopus flash cart-based games in the new year.